How to Manage Diabetic Foot Infections? Written by Dr. Davie Wong and medically reviewed by iCliniq medical review team. Work with your doctor (family doctor, endocrinologist, or internal medicine) to lower your blood sugar to prevent future infections and promote healing of your feet. 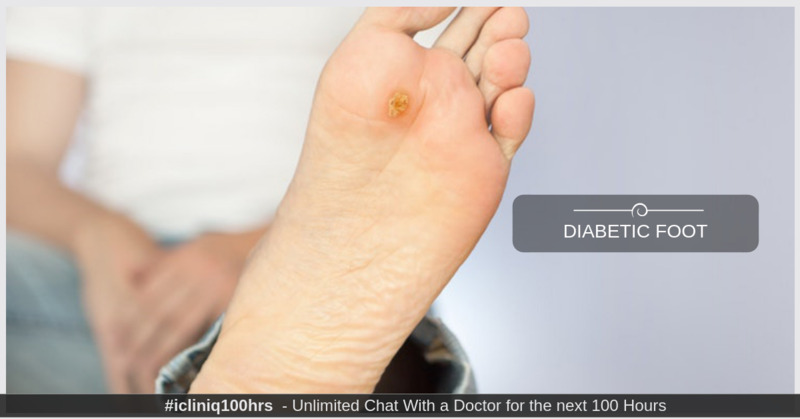 Poor diabetes control is often the major culprit leading to foot infections. Kindly explain if chewing nicotine gums increase blood sugar levels in a diabetic. You will need assessment of the blood flow to your feet and legs to check if there are any blockages in your arteries that may be impairing your ability to heal. A CT scan may be necessary to obtain images of your arteries to find out where the blockages are located. You may need to see a vascular surgeon to decide if there are interventions that can correct the blood flow. If you have a wound or ulcer on your feet, you need to avoid putting too much pressure on it for long periods of time to allow it to heal. If your job is physically demanding and requires prolonged periods of standing, your ability to heal your wound or ulcer will be impaired. Consider taking time off work or requesting modified duties. You should see a podiatrist to assess your footwear and to check if you need orthotics or off-loading shoes, sandals or boots. If you have a wound or ulcer on your feet, you need diligent wound care to keep the area clean. Home care nurses can provide wound care for you in the community. If you are mobile, you will need to go to a home care clinic on a regular basis to get wound care. If you are not mobile, a nurse may be able to come to your home to provide wound care. You may also need to see a wound care specialist if your case is complex. Antibiotics are used to treat infections of your feet. Your doctor will decide the best treatment for your particular case. Antibiotics may be given by mouth or through an intravenous catheter. Antibiotics alone are unlikely to be successful if the other components of your care are not addressed properly. Do you have a question on Diabetes or Blood Sugar Levels? My partner fears the dentist would pull out all his teeth. Are his concerns valid? What do hypochromia and anisocytosis mean?